This next week is an exciting one for us as we head to New York Comic Con for our first ever East Coast screening of the film as an exclusive Sneak Peek for New York Superweek. It happens at the prestigious IFC Theater on Saturday the 11th of October at 6pm. We will be joined for a Q&A after the film by our special guest Showrunner Janet Tamaro (Rizzoli & Isles) as well as the filmmakers themselves. 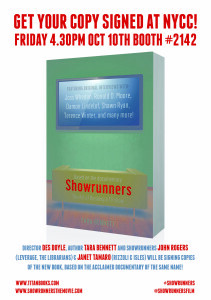 We’re also doing a Book Signing at NYCC this year on Friday October 10th from 4.30pm to 5.30pm with special guest Showrunners John Rogers (Leverage, The Librarians) and Janet Tamaro (Rizzoli & Isles) plus our amazing author Tara Bennett and our director Des Doyle. This happens at Titan Entertainment Booth #2142 on the Exhibition Floor at Javits Center. Hope to see you lots of you there and we will be wandering around the Con on other days too – if you see us please say Hi!